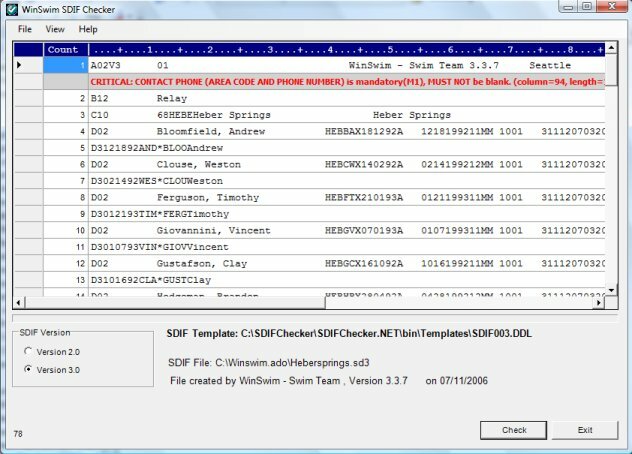 SDIF Checker provides an integrity check of these files checking each record for proper format, record length and field formats. This easy to use application allows meet coordinators to verify these files before importing them into their software applications or transferring these files to other teams. USA Swimming with the assistance of the software community, you know what I mean, created a software data interchange format for facilitating the transfer of computer data. Allows these SDIF files to be converted to a comma-delimited format that allows easy importing/exporting to Microsoft Access and Excel spreadsheets. Also, creates a populated Access database. The source code for SDIF Checker is available at Codeplex.com. Easy to edit templates allowing modification for future standards. Checks each field for valid values. Converts SDIF file to an Access database (Registered version). Converts SDIF file to a comma-delimited ASCII file (Registered version).